This is a follow-up post to my Delfonics Rollbahn Spiral Notebooks. Please read it first if you’d like more detailed look at the regular Rollbahn notebooks. I purchased this off-white Rollbahn notebook because I thought its textured cover was a nice variation from the regular Rollbahn notebooks. 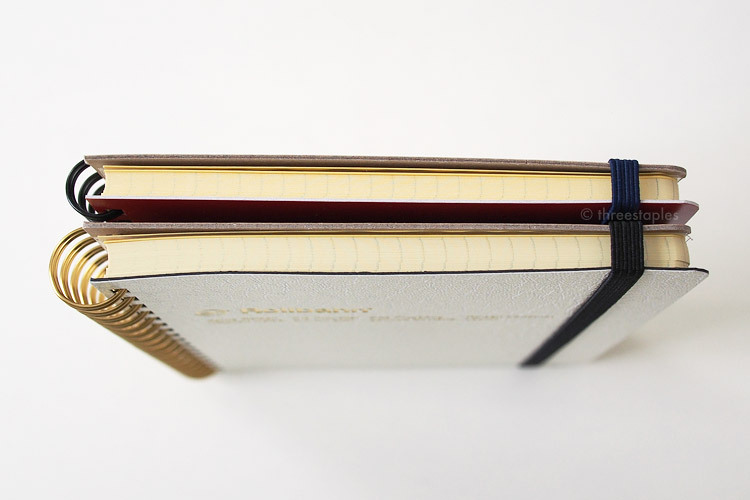 This cover has a faux-leather look, while the regular covers are smooth, with semi-matte finish. I thought the cover and the gold accents were the only differences but upon closer inspection, I found more, so I thought I would summarize them here. Faux-leather cover is debossed with gold text. According to Delfonics, this Rollbahn Memo with Pockets LP, as it’s named, is designed to look more “high-class” than the standard offerings, and you pay roughly 50% more for it. As far as I know, it comes in only one size “L”, which measures very close to size B6. And it comes in only 5 basic, muted colors: orange, black, dark blue, green, and white (the one in this post). The inside of this “LPL” notebook is pretty much the same as the regular editions though: the pale-yellow pages are perforated and graph-ruled in light gray, and there are 5 clear pockets in the back. The front cover is textured and debossed with gold text. The inside front cover is black, as opposed to the standard white. The elastic band is black, not navy. It has 30 more pages, totalling 170 pages, instead of 140 pages. Spiral size comparison: Regular L (top) has a much smaller spiral than the LPL (bottom). Although I agree that it’s a level up from the regular version, I am not sure I love the bigger spiral. Yes, it has to accommodate more pages, but the LPL notebook isn’t that much thicker than the original. It feels slightly bulkier to me, and I’m afraid the spiral will get dinged up more easily. You can see in my photo at the very top that I already managed to deform the bottom of the spiral a little. 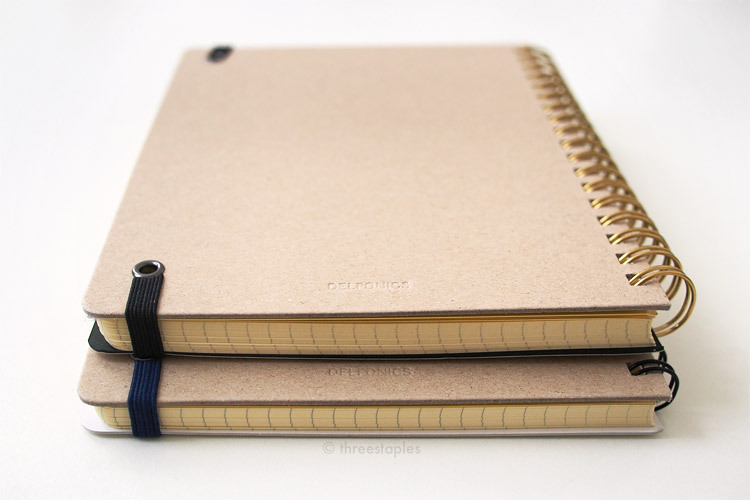 If you’ve read my Muji notebook post, you know I’m sensitive about these things! Inside of the front cover is black. Elastic closure comparison: black vs. navy! But I like that the bigger, shinier spiral renders the overall look more “executive”. It goes well with the gold title, especially on this cream cover. And the black elastic band makes the whole package look less casual than the regular version’s navy band; it also matches the inside cover nicely. Overall, it looks and feels great, and as I discussed in my first Rollbahn post, I love the quality of the body paper. As a fan of Rollbahn notebooks in general, I have no regrets having this textured version in my stash. I’ll just have to be more careful not to damage the spiral. Textured Rollbahn in “white” (left) and regular Rollbahn in “white” (right).